HMD hasreleased several Nokia smartphones and the time has now come for us to present you with our assessment. Today, we give you our complete review of one of Nokia's recent devices: the Nokia 3. How does it measure up to the competition? What’s it made of? Read on to find out everything about the Nokia 3. HMD released the Nokia 3 in February 2017 at the Mobile World Congress in Barcelona. The device doesn't seem to have been officially launched in the US yet but in the UK, it costs £129.99 and the available colors are white, black and midnight blue (a deep blue at the back and black at the front). Fear not though, it will come to the US, we just don't know when. So let's dive right in: for a smartphone in this price range, it's a very aesthetically pleasing device. When I saw it and held it for the first time, I didn’t feel like I was holding an entry-level device. The corners look very square but they’re very slightly rounded so it sits nicely in your hand, and the finish is excellent. Nokia focused on simplicity and elegance, which paid off because you’d have to be extremely fussy to find any negative points. The casing is made of metal. On the back, there’s a plastic shell (polycarbonate, to be precise) but rest assured, it’s aesthetically pleasing both to the eye and to the touch. Of course, we could be picky and point out that you can feel the transition between the casing and the shell, at the front between the casing and the glass, but this is a minor point and is not at all problematic. The small dimensions (43.4 x 71.4 x 8.5 mm) make the device easy to use and handle. Of course, it would be nice to have a larger screen (the size/screen ratio being 67.3%), but, in practice, it’s not an issue. With its small size and its weight of 140 grams, you’ll be able to carry it around and, unlike the Xiaomi Mi Max 2 that I tested just before this phone, you won’t have any problems using it in any setting. The good news is that Nokia offers the Dual SIM feature despite its small size. What’s even better is that you can also insert a microSD card in another slot. On the other hand, the smartphone doesn’t feature a fingerprint scanner, which is a shame because certain competitors in a similar price range (such as the Moto G5) do offer this feature. The device also doesn’t feature the Type-C USB, but that’s (unfortunately) not really a surprise. Like the Google Pixel, this Nokia 3 has a 5-inch screen. With that said, they don’t have much else in common (which makes sense given the difference in price). Nokia uses LCD technology and a 720p (720 x 1280 pixels) resolution, offering a pixel density of 294 ppi. Let’s talk about the practical side: how does the screen cope in real-life conditions? A trained eye could spot the screen’s weaknesses but everyday users, meaning the average user of a typical smartphone, should be satisfied. The brightness is too high, which doesn’t always make for pleasant everyday use of the smartphone when you wake up in the morning or when you go to sleep at night. The disadvantage is that there aren't many configuration settings for it. If you want to more concrete figures, GSM Arena indicates that at 100% brightness, the brightness is 477 cd/m² for white and 0.353 cd/m² for black. HMD promised a simple software interface (like Google) to be able to offer quick updates. Of course, it has stock Android and, it goes without saying, Android Nougat but not the most recent version: it has Android 7.0. 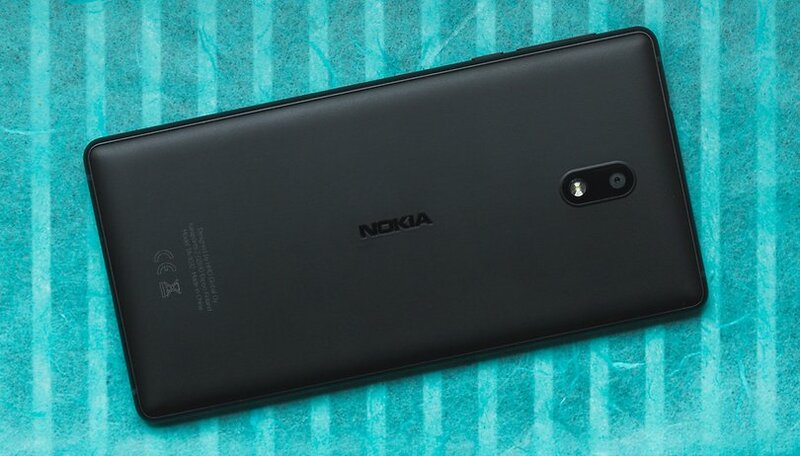 In comparison, the Nokia 5 runs Android 7.1 and received a security patch in June, while the Nokia 3 is still running on the patch from May. HMD kept its promise. The only preinstalled apps are those from Google. HMD thinks that it’s useless for a manufacturer to offer their own apps as alternatives by default. The only element from Nokia that I could see was a poll that appeared at the start of my review. It’s not an app really, it’s more of a service. Not preinstalling apps is a great move my HMD. It also avoids needlessly taking up memory on the system that is already rather small (only 16GB of available space). Of course, you can use Google Assistant on this device. The Nokia 3 is an entry-level smartphone, so don’t expect any miracles. It uses a quad-core Mediatek MT6737 processor (maximum speed of 1.4GHz) and a Mali-T720MP1 graphics chip. In order to support these, HMD has included 2GB of RAM and 16GB of storage memory. Part of this is used by the system and 16GB isn’t a lot. If you want to take a lot of photos or store data, you’ll fill it up quickly. The microSD card is an important touch for this phone. In practice, we can clearly see that, in daily use, this phone isn’t a reference device. The download times for apps are often long and it’s better not to overload it. It gets slow if you open too many apps at the same time. As for the power-hungry apps/games, don’t expect to have a completely fluid experience either. In the benchmark tests, the device showed rather weak results, which is hardly surprising. The device’s SAR wasn’t noted in the documents provided but HMD has confirmed that the SAR is 0.484 W/kg. In terms of 4G, you won’t have any issues. Don’t expect to use this smartphone to listen to music without headphones because, as you can imagine, the audio experience isn’t the best. The loud-speaker is on the bottom of the device, to the left of the microUSB slot. HMD have included headphones in the box, they’re not particularly attractive but they do the job without any issues. The Nokia 3 has a sensor on the front and on the back that offers autofocus, f/2.0 aperture, a viewing angle of 84 degrees and 8MP. This isn’t great and, in practice, the results confirm it. Even in good lighting conditions, the photos lack detail and the colors are faded. The dynamic range of the sensor leaves much to be desired. It leads to under and over exposure of the images. The device has a HDR mode to compensate for this problem which is typical on smartphones but it slows down the camera app and distorts the images. Moving objects become ghostly shadows in the photos. In artificial lighting, meaning photos taken indoors or even in poor lighting conditions, and with an ISO superior to 400, the image quality is affected by the obvious noise. With that said, it’s worth noting that entry-level smartphones aren’t manufactured to be used for taking photos. If you have a tight budget and if photos are important to you, you could look and see if the grass is greener on the competition’s side, for example, the Moto G5. HMD has included a 2630 mAh battery in this smartphone, which isn’t much in itself but, given the size and the resolution of the screen, one might think it’s enough to offer satisfactory battery life. It's not. With moderate usage, you’ll get a day’s use out of the smartphone. However, if you want to use your smartphone frequently (WhatsApp, watch videos on YouTube, surf the internet, etc. ), you’ll have to charge the device throughout the day. This happened to me several times and I had to charge my device in the afternoon. It’s a real shame. In the PC Mark benchmark test, with Wi-Fi turned on, a SIM card inserted and brightness set at 50%, the device achieved a score of 6 hours 44 minutes. This isn’t terrible, but keep in mind that benchmarks aren’t necessarily representative: the usage and the installed/launched apps can produce different results from one user to another. For a great price, you can get an attractive design and nice build. HMD has produced a smartphone that is pleasing to the eye and to the touch. It’s an entry-level smartphone so don’t expect miracles: the performance, camera and battery leave much to be desired. it's a shame that the smartphone doesn’t offer any special features (apart from a redesign of the former Nokia ringtone). For a few dollars more, the Moto G5 also offers stock Android but it offers quick charging too. The Nokia 3 is a good smartphone for the entry-level user, but it appears to have been overworked in terms of design and a little rushed in other aspects. What a pity. Sir, I'm using Nokia 3 The Smartphone has awesome design and look, but battery is just 2600 mAh. So my question is What to do to run Nokia 3 battery more ? Please give me some profitable tricks. Nokia isn't what it used to be anymore,they have to learn soon that the competition have upped their game! I know someone who bought one and its very disappointing, poor visible home buttons, camera is woeful, performance isnt that good, battery life is poor. Nokia will have to up their game if they want to sell phones.